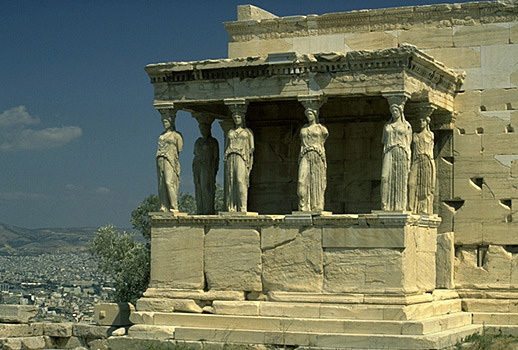 Sculptural Program of the Temple of Athena Nike. South Frieze of the Temple of Athena Nike: Battle of Marathon. 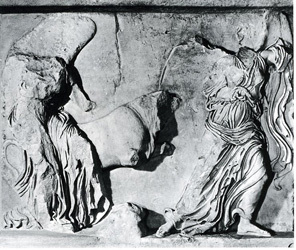 The dress of the enemy in this frieze identifies this as the battle of the Greeks and Persians at the Battle of Marathon. It is significant to note how there is no representation of the Hoplite phalanx, but the battle is represented as a "man on man" combat typical of the mythical and legendary groups on the Parthenon metopes. Reconstructed plaster casts of the Tyrannicides. 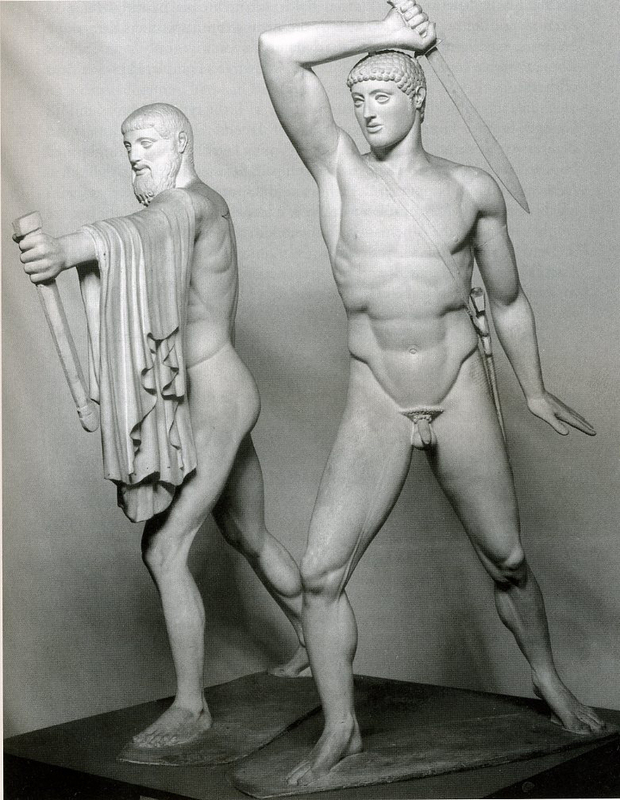 The bronze original was by Kritios and Nesiotes. 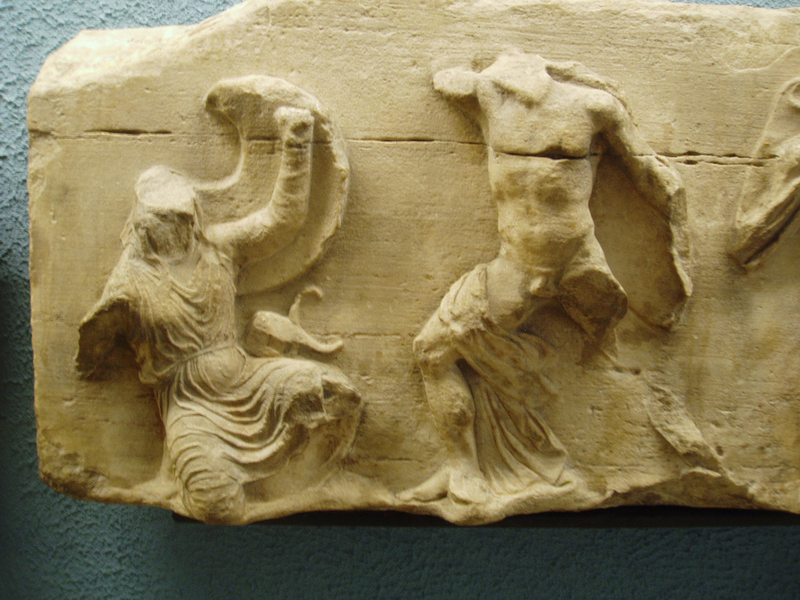 Two Athenians, Aristogeiton (bearded) and Harmodius, assassinated Hipparchos, one of the two sons of the tyrant Peisistratus, in 514. 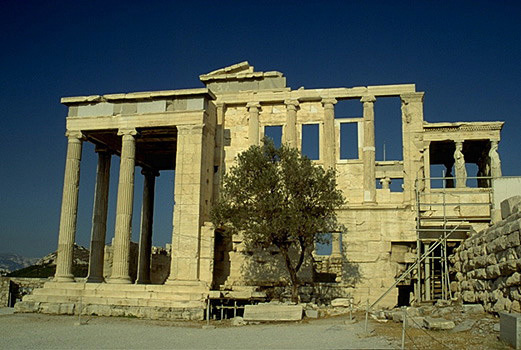 This event helped lead to the expulsion of the other son of Peisistratus, Hippias, in 510 and the establishment of Athenian Democracy. 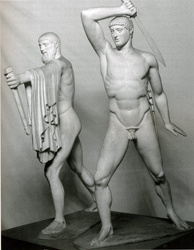 A bronze statue of the pair was made by Antenor and placed in the Agora near the assembly. 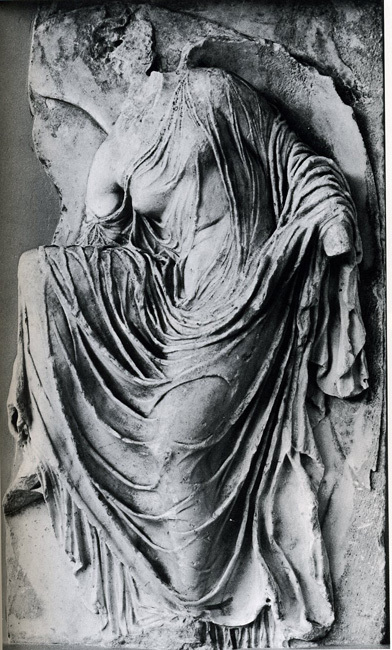 This statue was sacked by the Persians in 480 BCE. 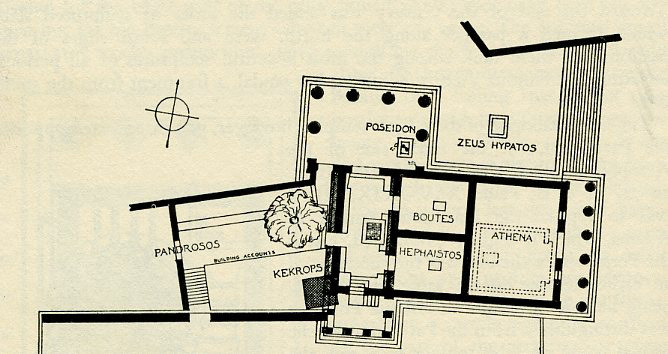 The Kritios and Nesiotes group was created as a replacement in 477/6. 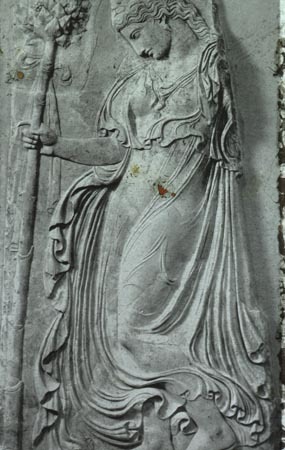 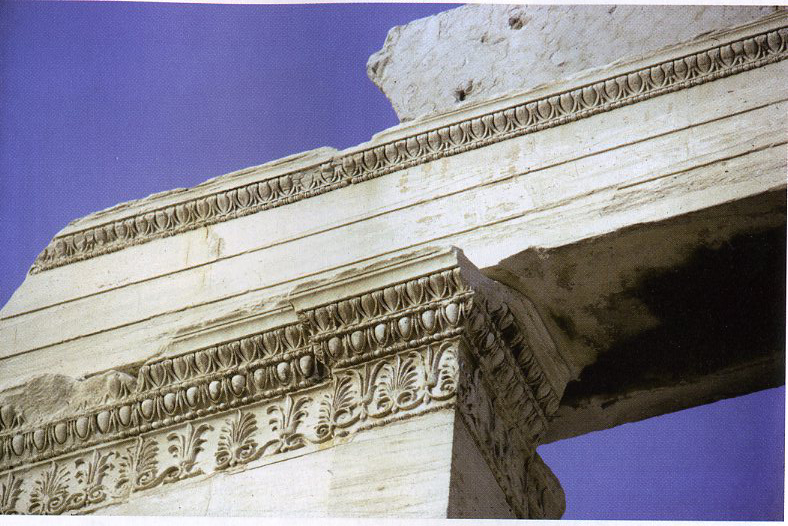 Detail of the South Frieze of the Temple of Athena Nike. 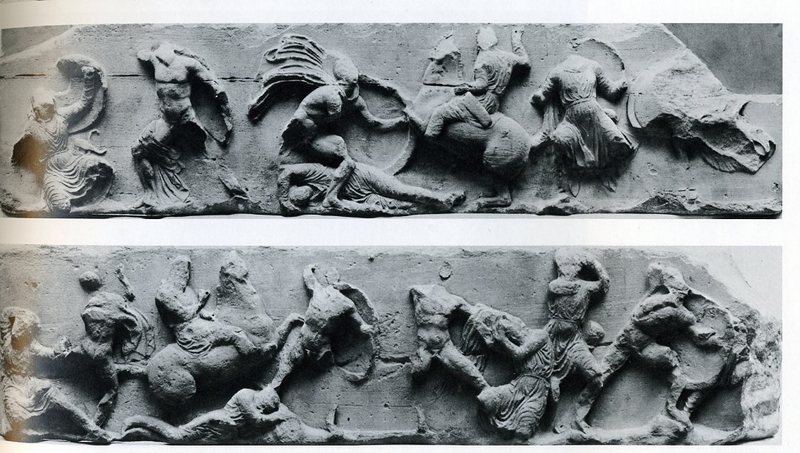 Note how the Greek in this battle scene with a Persian is apparently dependent on the figure of Harmodios. 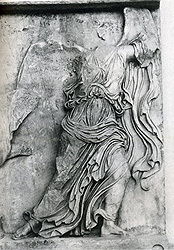 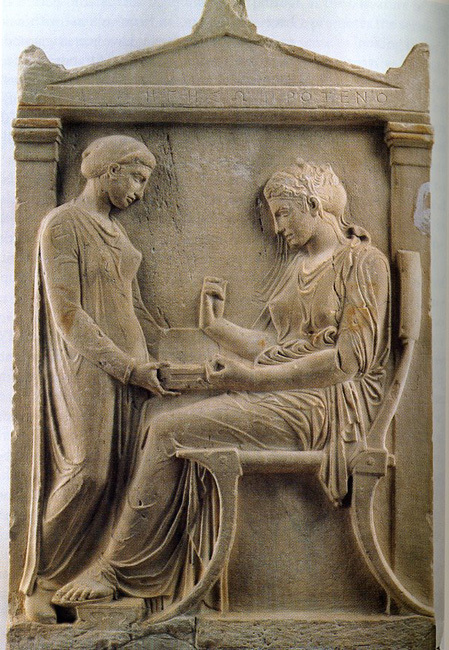 Nike binding her sandal from the parapet of the Temple of Athena Nike. Nike from the parapet of the Temple of Athena Nike. 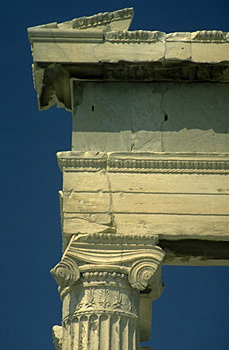 Nikes with Sacrificial bull from the Temple of Athena Nike. 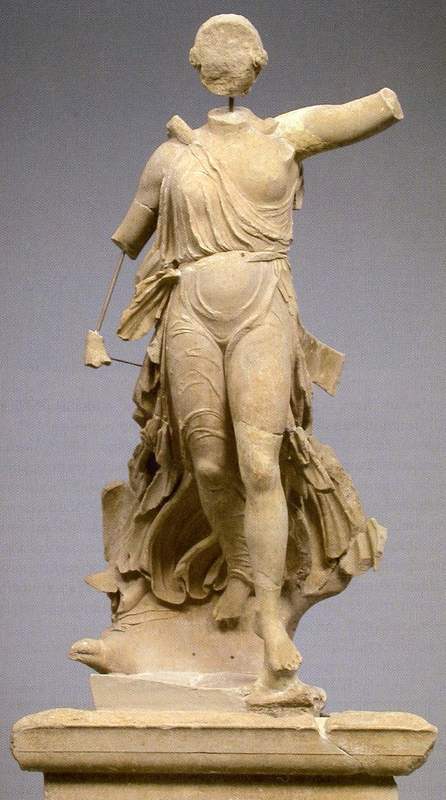 Nike by Paionios from Olympia, c. 420. 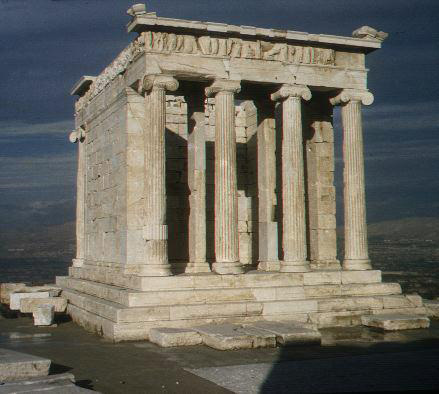 Pillar on which this figure was placed bore the following inscription: "The Messenians and Naupaktians set [this] up to Olympian Zeus as a tithe from the spoils taken from the enemy. 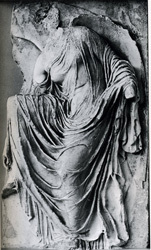 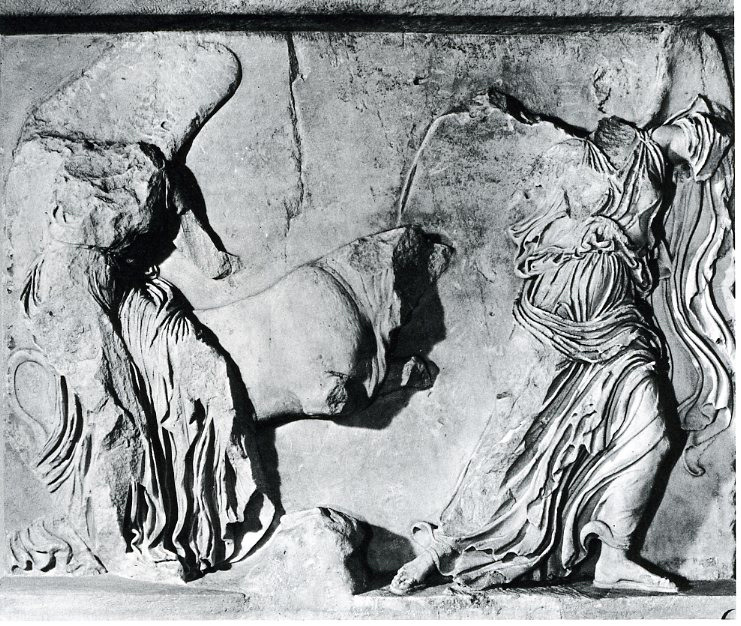 Paionios of Mende made it, and he also won the commission to make the akroteria for the temple"
Roman copy of a dancing Maenad, orginals c. 410-400. 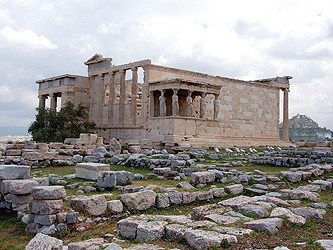 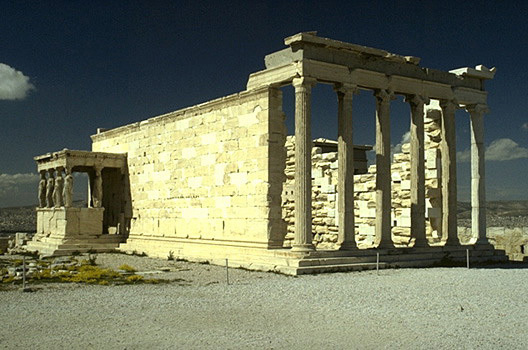 Erechtheum (Erechtheion), c. 421-405 Pollitt, Art and Experience in Classical Greece , pp. 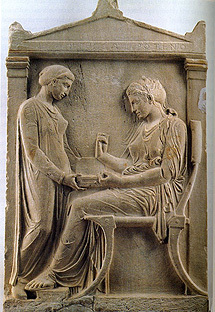 132-133 presents the following summary of the dedications of the Erecththeum: "The area which the Erectheion eventually occupied includes the most ancient shrines of the Acropolis, sites connected with fertility cults, chthonic deities, and hero cults whose origins stretched into the remote Bronze Age and perhaps, in cases, even into the Stone Age. Here were the tombs of Kekrops, Erechtheus, and Bootes, early kings of Athens; the miraculous olive tree of Athena; the trident mark and saline springs left by Poseidon; the crevice in which the child god Erichthonios guarded the Acropolis in serpent form; a sanctuary of Pandrosos, the 'moistener of all,' one of the three daughters of Kekrops who went mad and jumped from the Acropolis when they beheld Erichthonios in the form of a snake-legged child; and other shrines as well." The eastern cella was dedicate to Athena Polias. The cult statue of Athena was kept in here. 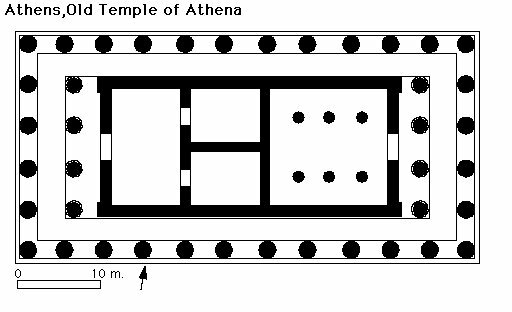 Plan of the Old Temple of Athena destroyed by the Persians in 480 BCE. 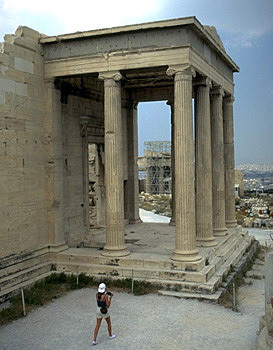 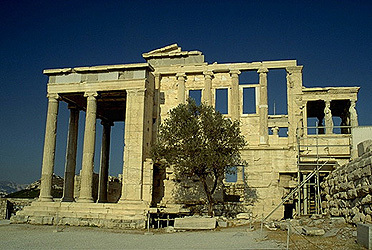 The foundations were left as a reminder of the sacking of the Acropolis. The east chamber contained the cult statue of Athena that was the focus of the Panathenaic procession. 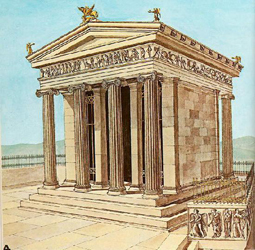 Note how the rear or western chambers are echoed in the plan of the Erechtheum. 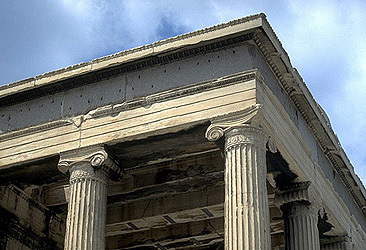 Detail of the south east end of the Erechtheum showing moldings and architrave with palmette, egg-and-dart, and bead and reel moldings. 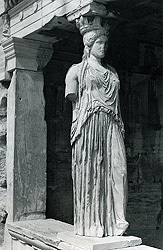 Caryatid from Porch of Maidens. 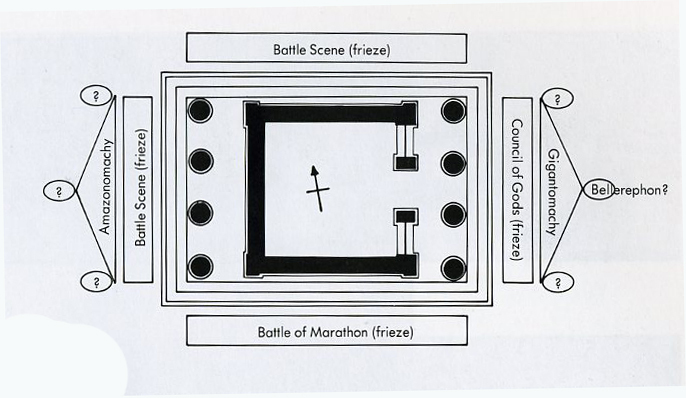 Inscriptions refer to these as "korai." Archaic Kore from the Acropolis, c. 520-510. 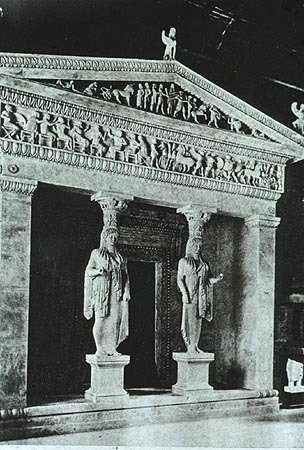 Siphnian Treasury from Delphi, c. 530-525..